The value of education in the workplace is well documented. Bureau of Labor Statistics data show that earnings consistently increase with the level of education. On average, workers over 25 years old with bachelor’s degrees earn an astonishing 70% more than their counterparts with high school diplomas. Education beyond a bachelor’s degree increases earnings even further. In addition to completing a college degree, people are turning to certificate programs to boost their earnings, add competencies to their professional toolboxes and improve their career prospects. Certificates are nondegree programs that offer practical, concentrated study in a particular professional area. They provide a way to earn a credential in a relatively short time—generally between four months and a year. A recent study by Georgetown University’s Center on Education and the Workforce called certificate programs a gateway to gainful employment and college degrees. “Certificates are a homegrown American invention and are expanding rapidly in response to a wide range of educational and labor market demands,” reported the Georgetown researchers. A major finding of the study is that the postsecondary certificate has become a cost-effective tool for increasing educational attainment and gainful employment . The University of Delaware’s Division of Professional and Continuing Studies offers a range of certificates in the health care, legal and business fields: Analytics–Optimizing Big Data, Business Analyst, Clinical Trials Management, Lean Six Sigma Green Belt, Paralegal, Advanced Paralegal, Project Management and Social Media Marketing Strategy.Certificates meet in the evenings in Wilmington starting in September. 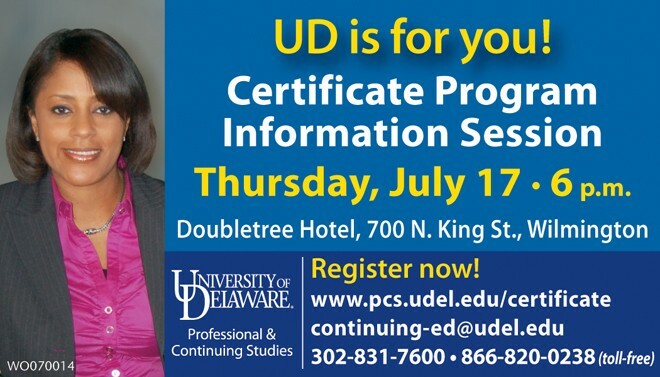 call 302-831-7600, visit www.pcs.udel.edu/certificate/ or write to continuing-ed@udel.edu. For those considering a return to college, whether for a degree or certificate program, the University of Delaware ACCESS Center provides free advisement. Advisors can help identify career and educational goals, develop educational plans, implement decisions and build learning skills. The ACCESS Center can be reached at 302-831-7600. ← Previous Story A Revolutionary Difference For Students! Next Story → One Student. One Teacher. One Revolutionary Difference!